Baby's First Holiday - Flying With A 6 Month Old! We promised we weren't going to go on anymore holidays this year LOL! Next thing we know is that we've got our newborn baby boy's passport ready and we're booking a last minute break for some sun! We arrived in Kefalonia after a decent experience of heading through the airport and onto our plane. My 6 month old son slept through the flight. Waking up in Kefalonia to a scene of grey clouds. Rain and a chill in the air. OH NO! All was well after that 15-20 minute prank from God though! We were blessed with gorgeous weather all throughout our stay in Kefalonia also known as Argostoli. This was the first time I had ever booked holiday homes with private pools. It had to be done for a number of reasons. One of those reasons being that I'm a tired new mum. Traveling from place to place was not something I wanted to do with a tiny baby. Having a private villa and private pool to ourselves, meant I was able to breastfeed comfortably. Sleep when and where I want, and not have to worry about my baby getting fussy out and about around strangers. Our first location was advertised in a bit of a deceptive way. I thought the pool area was private however, this wasn't the case. It was a pretty quiet pool anyway and we had a chat with a friendly Brit who was staying in one of the flats overseeing the pool. Our apartment was wonderful. With a light airy feel and the whole complex is away from other properties, with peaceful vegetation all around. So no complaints. Our second property had to be the best of the bunch. Literally one of the most amazing places we've ever stayed at. I wish we could have booked it for longer. The private home with pool is up high on a mountain, with breathtaking mountain views. The garden grounds are perfectly manicured. There's loads of private spaces to chill out and wander around. The 3rd property I booked was another beauty, with three bathrooms. One of which had a large shower unit, designed for two to share. Plus only two minutes walking distance from a peaceful, sandy beach and a really short drive from the airport. The beach near our third rental was really nice. Not to loud or crowded and the rows of loungers and parasols were needed. As the sun rays and sand were super hot! A special treat at this beach is the fact that aircraft come in to land close overhead, as the airport is almost next door. A less touristy version of Maho beach in St Maarten. It was actually quite exciting to change property locations during our holiday. I think this will become the new way I travel from now on. Our six month old baby had so much fun. 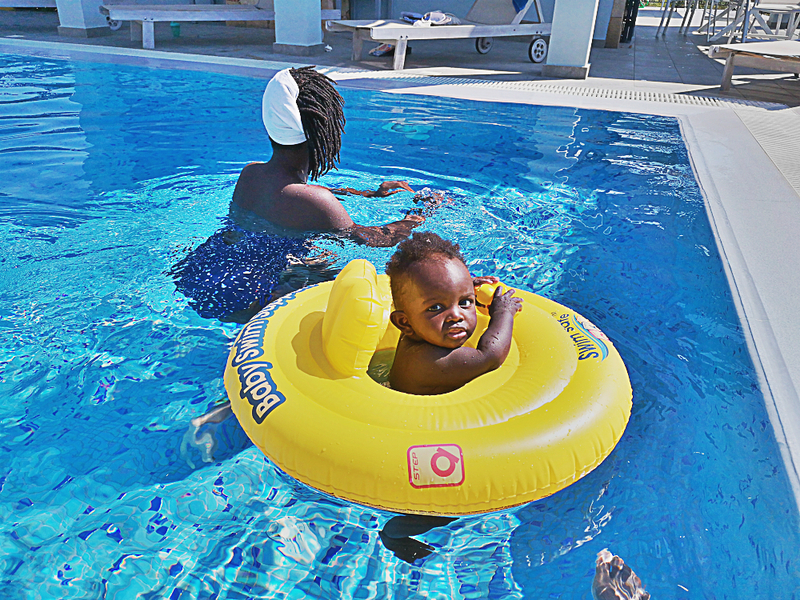 He had peaceful naps under the sun and enjoyed splashing about in the sea and private pools. Found this review of Kefalonia interesting? Subscribe to www.GoneSunWhere.com for more of the best holiday destinations.